Golden brown and extra crispy; whether used soaked with aromatic syrup for desserts, or filled with creamy, juicy fillings, phyllo dough always gives a rustic touch to our homemade pies and desserts! Phyllo dough is our number one, favorite foil for making numerous Greek savory pies, like cheese pies and spinach and feta pie and mouthwatering vegetarian appetizers. And of course there is a whole collection of phyllo dough Greek desserts, like our favorite baklava and galaktoboureko. 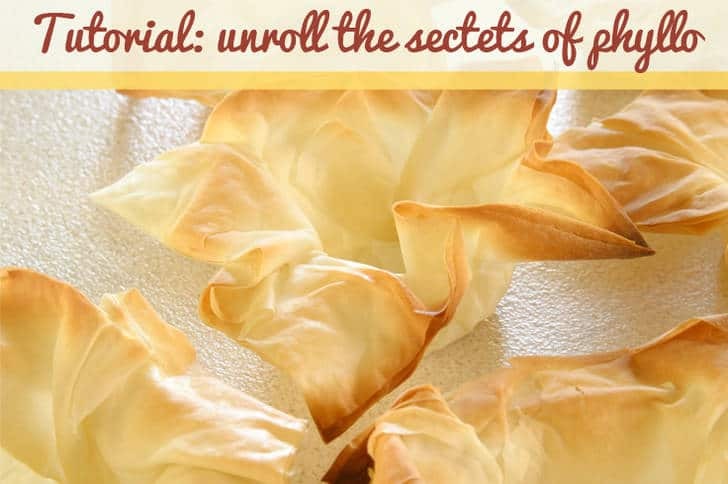 Phyllo dough, also spelled ‘fillo’ comes into tissue thin sheets, stacked and wrapped together into rolls or flat squares and can be find fresh (more rarely) or frozen in the frozen food section. 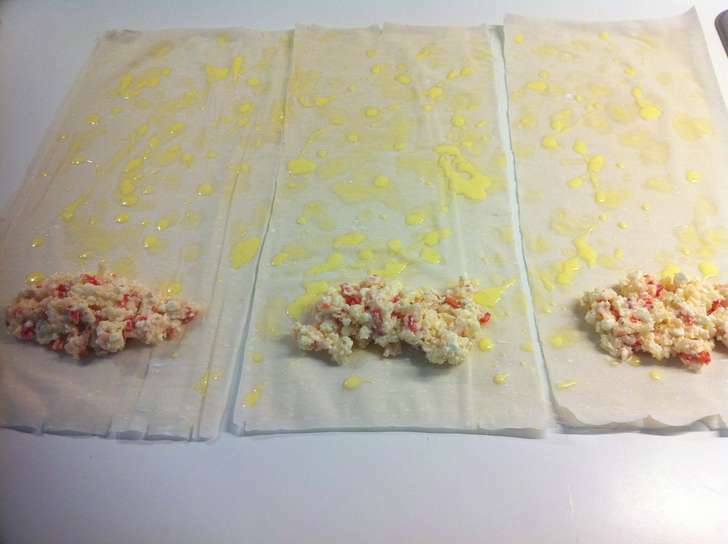 Phyllo sheets can be used whole or cut in size according to the recipe. Working with them can sometimes get tricky, as it can become gummy, or brittle, if handled the wrong way. Let’s share some of our secrets from own experience, that will help you never to fail. 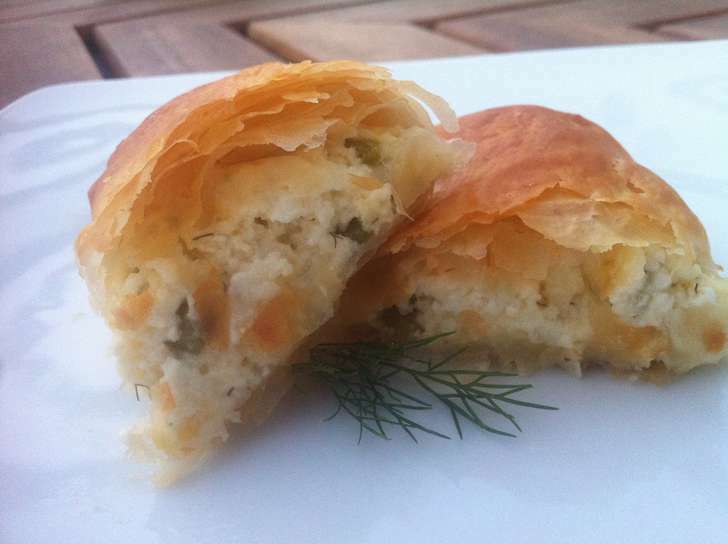 Thaw the phyllo dough, with the package closed, overnight in the refrigerator. A very common mistake is to leave it defrost at room temperature as this will make the outer layers gummy; when working with phyllo dough, it should be defrosted, but still cold. Prepare a surface large enough to use as a work space (not floured). Unroll from the plastic sleeve, only when you are ready to use, as it dries out really quickly and will be hard to work with. If your phyllo dough must remain out of the packaging for longer place it between two damp kitchen towels, wet enough (not soaked into water) to give the dough some moisture. Remember to preheat the oven, so that when done you are ready to bake right away. Always work with your hands dry and use a sharp knife to cut into size when required. Some pieces may crack or tear when coming out of the package; that’s OK. You don’t have to through them away, just use them in the middle of you pie, or dessert, where no one can see them. Use a pastry brush to brush the phyllo sheets with butter, as it works well to fuse them together. If some are dry in the end, just use a little bit more. Remember to brush thoroughly the top layer with enough butter, to become crispier and nicely colored, and prevent from getting burnt. Phyllo dough sticks to the baking tray really easily when cooked. To prevent it from sticking, always thoroughly butter the bottom and the sides of your baking pan with enough butter, or use cooking parchment paper, depending on the recipe. Score the top of the pastry with a sharp knife; that is going to give a chance for the steam to escape and, when baked, it will form a guide to cut your pieces. If you have any unused phyllo sheets left wrap them firmly in plastic wrap, place the phyllo dough into it’s original box and refrigerate as soon as possible. You can also read this article in Greek here ‘Ξετυλίγοντας’ τα μυστικά του φύλλου- Πώς δουλεύουμε το φύλλο κρούστας. I WOULD LIKE TO HAVE THE SELLERS OF PHYLLO DOUGH IN WHOLESALE.